“Tulipani” dining or centre table by Piero Fornasetti depicting colorful tulips on a black background. Wood base with brass feet. Original label below top. Condition: Good vintage condition, minor wear consistent with age and use. Minor surface unevenness. Measures: Diameter 45” Height 29.5”. 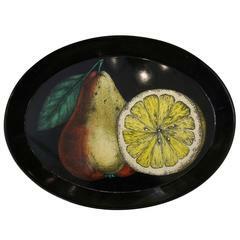 Pear and lemon motif tray by Piero Fornasetti. Produced in the mid-1950s as per the Fornasetti catalog. Original label on the back. Ideal as a kitchen or dining area decoration. Thick resin top round table in tortoise brass finish base. Harvey Probber (American, 1922-2003) Harvey Probber Inc., circa 1950 centre or dining table With inset travertine top, ebonized walnut, raised on trellis base. A semi-gloss finished mahogany base with four tapered legs and a round under-the-top shelf (with two brass stretchers), supporting a jade and red/brown mottled Onyx top.